NewTekTM today unveiled the next generation of its industry-standard, professional TriCaster multi-camera production systems, introducing three new models—TriCaster 860, TriCaster 460, and TriCaster 410—and major enhancements to the company’s flagship system, TriCaster 8000. 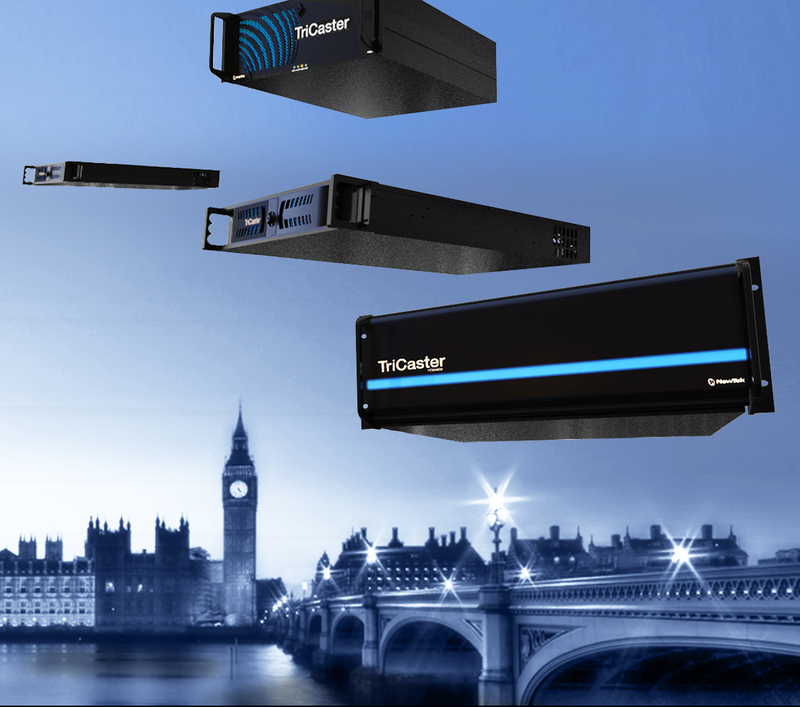 The newly expanded product family offers a number of innovative industry firsts that represent a quantum leap forward in integrated live video production and enable video producers to deliver programs with a level of quality and visual impact that has never before been possible with single, turnkey multi-camera production systems. All products in the new line will begin shipping on September 12, 2013, just prior to the IBC 2013 convention in Amsterdam. The entire professional TriCaster product line incorporates across-the-board breakthroughs in integrated multi-camera live production. All systems now offer 4 or 8 full mix/effects (M/E) channels, greatly expanding the system’s switching performance. Producers can use these M/Es to generate layered and composited real-time video, produce sub-mixes in the main video program, and output content as a secondary program—all with complete switcher behaviors, transitions, overlays, multi-source layering and virtual sets. Additional enhancements that are now standard across the entire product line include vastly advanced virtual sets with new camera motion controls; new “holographic” virtual sets that blend panoramic images with layered and composited video; broad media publishing functions for simultaneous multi-channel content delivery; expanded buffers for creating hundreds of custom motion and animated graphics; new, unique remote robotic camera controls; and extensive macro and automation functions that greatly simplify the execution of system commands during a live program and integrate with venues that already use comprehensive MIDI automation. · TriCaster 410—a streamlined, compact system with a full 4 M/E production switcher, HD-SDI connectivity, and tools for live-only delivery, ideal for anyone producing small to medium-sized live shows or webcasts with powerful media sharing and disk recording capabilities. · TriCaster 460—a compact system with a full 4 M/E production switcher with greater connectivity and broader creative flexibility for any small or medium-sized production, particularly where live video content is touched up, re-packaged or repurposed for postproduction or supplemental programming. · TriCaster 860—a system designed for full-sized live action with an abundance of angles, visuals, coverage and postproduction tools, offering a full 8 M/E production switcher, plus more channels, sources, I/O, graphics and effects, and greater capacity for media storage. · TriCaster 8000—the flagship content publishing hub for all the media in a live program, with a premium 8 M/E production switcher, built-in failsafe and redundancy capabilities, and extensive router support for enhanced broadcast integration, massive multi-camera coverage, and mission critical high-end productions of any size. All TriCaster models include comprehensive feature enhancements that enable producers to create bigger and better shows, and reach larger audiences with network TV-style video content—while also significantly lowering production costs. With any TriCaster system, users can reduce the many racks of equipment and crew often required to produce a multi-camera show. Extensive control and automation functions—helping operators to minimize on-air mistakes by customizing memory presets for recalling only desired program configurations; automating show commands with single keystrokes; defining custom control surface keys or MIDI control with external devices used in lighting and audio installations; and using Hot Spots to trigger automated sequences with on-camera talent gestures. Pricing and Availability Starting prices for the next-generation TriCaster family are TriCaster 410 for $9,995 USMRP; TriCaster 460 for $15,995 USMSRP; and TriCaster 860 for $24,995 USMSRP, with optional control surfaces for these systems sold separately. Pricing for TriCaster 8000 with the included control surface is $39,995 USMSRP. Customers who own TriCaster systems and are interested in upgrading can choose from a range of upgrade options. Specific pricing for countries outside the US and for multi-standard units will vary. All of the new TriCaster systems will begin shipping on September 12, 2013. For full details on all next generation of professional TriCaster systems, please visit www.newtek.com.